Cart2Cart’s devoted Team gladly makes another contribution to extend your migration possibilities! Working our fingers to the bone, we can announce about support of VirtueMart 3.x. Great, isn’t it? Thus, now you are allowed to update your VirtueMart store to the latest version and revel in its improvements. Yippee! Recently VirtueMart has released its new version surprising the users with fancy functionality. There is no doubt that its developers have kept nose to the grindstone to improve shopping cart’s features. Now it is fully compatible with Joomla 3 and can boast with clean architectural structure. Among the most prominent enhancements there can be pointed out three categories: for developers, for merchants and for customers. Cart content can be saved to continue checkout later (for registered users). Increased ability to restrict or manage employee access to key functions using access control list. Core and extensions are now working with a new abstraction layer. There is no doubt that VirtueMart 3.x is a breakthrough for the Joomla community. Such set of feature can be a good hand of help in improving store functionality to increase its profitability. 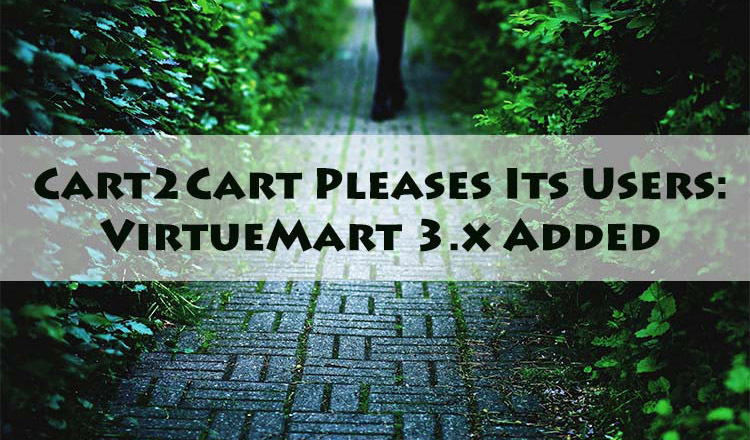 Now Cart2Cart provides migration to VirtueMart 3.x, so don’t miss your chance to get a possibility to improve your store.